Ever since the Grand Exchange was released, and even before, a common request has been for us to release lootshare. We definitely agree and we are now in a position where we can offer it to you but we would love to discuss the different ways that we can implement this system and what you all think is best! For those who have never encountered lootshare in the past, the system aims to share out loot evenly across a PvM team. This then means that the player who does the most damage does not simply receive the drop, and instead, it chooses someone from the team based on each player’s lootshare potential (LSP). As more complex boss fights are added to the game, players are required to do roles outside of just dealing damage and hence they would never receive the drops. When a player receives a drop, the value of that drop is taken away from their LSP, and that value is then spread among the rest of the team and added to their potential. This means if you miss a Bandos Chestplate drop for example, you will have a high amount of LSP, meaning an increased chance of you receiving each drop. The next time a Bandos Chestplate comes around, you’ll have a much better chance at receiving it! A big issue with the original implementation of lootshare, was that it was done to be intentionally unpredictable. Being released in a time with no free trade, it was done this way to prevent players from having a predictable method of exchanging wealth. •	Rank the top 2 players of the group with the highest LSP. •	Rolls a 30% chance of giving the loot to the highest rank. •	If that fails, roll a 15% chance of giving the loot to the second rank. •	If that fails, select a random person out of the whole group (including the first 2). •	If the selected person has negative LSP, they receive the drop with 0.01% chance. •	If that fails, give the drop to the highest rank player. •	Unless you’re ranked in the top 2, there is no benefit to having higher LSP. •	The difference in LSPs makes no difference. 2GP LSP vs 1GP LSP is the same as having 200,000,000 LSP vs 1GP. •	It is not a particularly much better chance for the two highest ranks either. Meaning many players were often left frustrated, whilst having the best LSP, they would miss the next high value drop. We have some ideas on tweaked systems or alternatives that we can offer that would perhaps be preferable. We could take into account the ratios of LSP in the team, simply make the system more favourable to having higher LSP. We could introduce completely different elements, taking into account each player’s damage dealt values and using those to make a random choice on who should receive the drop or even offering a complete randomisation mode where it would select someone in the team with an even chance for all (this could be done even with another system in place too). All in all, we would love your thoughts on the lootshare system and any suggestions for alternatives or thoughts on our brief proposals. A common request with lootshare in the past, was to make your LSP value visible to you. Allowing you to determine if you’re likely to be receiving drops and just to see the system taking place. •	If LSP or rank is visible, players may choose to just leave and join new teams until they find a group of players of which their own LSP is superior. •	Players may feel more aggrieved when they have the best LSP but do not receive the Elysian sigil drop for example. Your opinions on this matter! We will be reading and listening to see what you all think should be done here, if anything. Especially in a way to mitigate the issue. In the original lootshare system, each player’s LSP decayed over time. The value would trend towards 0 by 10% each day. The issue is that especially for a boss like Corporeal beast, where the sigils are extremely rare, a team may go days or weeks without seeing one. This means it’s likely a player’s LSP will decay by the time a drop comes around – therefore encouraging players to play nonstop whilst they have high LSP. We are considering not having LSP decay at all, increase to 0 only when it’s negative, or just reduce the decay percentage. Again, your opinions on this matter! One feature of the lootshare system was to have worlds that lootshare can be used on, this meant there were some worlds that were left open for players to battle for the drop as normal and avoid having a lootshare team come in and easily beat them to the drop. Based on what happened in the past, lootshare worlds became very popular and the other worlds were mostly empty. This meant we received constant requests to make more lootshare worlds as it was difficult for teams to find an empty boss room. Hence, our initial feeling would be to make the majority of worlds lootshare worlds. Alternatively we don’t have to have lootshare worlds at all, essentially every world would be valid for lootshare. This will of course, start some debate about coinshare. Due to the impact the original coinshare system had on the economy, we do not wish to offer this at this stage. For those not aware, coinshare would instantly give all members of the team an even split of the item’s Grand Exchange price and the item would go onto the Grand Exchange at said price. If the item’s real value was much lower however… this offer would never be filled hence that amount of coins were added directly into the game and never taken out. We have a solution in mind for having a coinshare system that does not cause large amounts of gold to come into the economy but it will take more substantial engine development time and so we will choose to offer that at a future date if there is sufficient interest. So there is much to discuss and much to gather feedback on! We will be polling Lootshare in the PvM QoL week of this month and will have another dev blog up before then to outline the system we are going to poll. 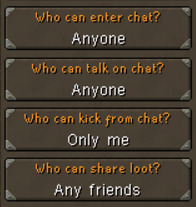 One thing we’d like change, is allowing the ability to choose to share with anyone in your friends chat, not just people you have added. This makes it far easier to run large community events without every player having to be added to be able to have their share of loot. The system, visible LSP or other info, decaying LSP and lootshare worlds. The item received should be sold for the highest buy offer currently in GE, instead of creating money out of air and distributing it. Would also be nice if there was a collection box at the bank where you would be able to collect your coin share split, instead of it spawning on the ground. People are always flipping the items so the prices will remain fair. This would be the only downfall to using coin share so if you prefer making a few extra 100k-5m depending on what the item is then you can use other methods like loot share and get the item to sell it yourself. We could take into account the ratios of LSP in the team, simply make the system more favourable to having higher LSP. Also you are on a good point when it comes to not decaying your lsp when lootshare will mainly be only used at corp.
We definitely need a decay over time. I'm fine with the old 10% but I think not everyone would agree with me. 5%/day maybe? Would bonus drops be handed out in the same way as other drops? I'd prefer a small LSP Decay. Having it decaying while doing corp would be frustrating but it would get people Pvming more. Hidden LSP Points would probably be my preference so the people you PvM with wouldn't pick and chose their teams based off of other's LSP until they have the highest potential.